Harris and Goldie have started eating solids over the past couple of months, and Harris is especially loving them! He opens his mouth big and wide so he can get as much food in his mouth as he possibly can. It is so adorable to watch your babies learn and enjoy new things! What do I feed my baby?! As a new mama, I had no idea where to start with solid foods so I asked my pediatrician. 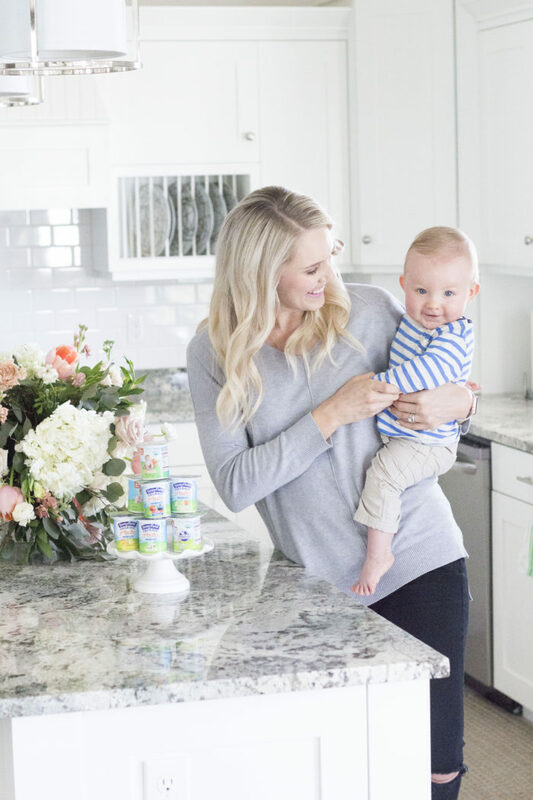 Stonyfield research found that at least one-third of parents admit to feeding confusion during baby’s first months and just over half (53%) feel overwhelmed by the varying opinions of early childhood nutrition. That was me! That confusion may be why many parents may overlook including daily probiotics in their baby’s diet. In fact, 77% of the surveyed parents with children under two do not incorporate probiotics into their baby’s daily diet, with 36% of them thinking it’s not important at this age. 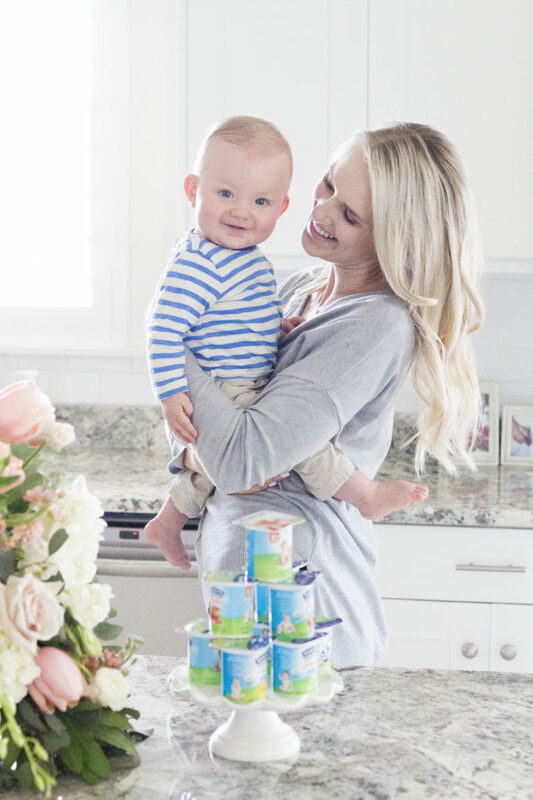 Despite all yogurt’s benefits, just over one-third (34%) of parents with children under one year old mistakenly believe the age to introduce yogurt is 12 months or older versus the AAP approved age of six months. We started with rice cereal and then started mixing in foods like avocado and vegetables. I wanted to start with vegetables so that he could get used to eating foods that weren’t sweet. Harris wasn’t a big fan of peas (I don’t blame him…the smell!) but as you can imagine, he immediately loved the Stonyfield YoBaby® yogurt when I introduced it to him. 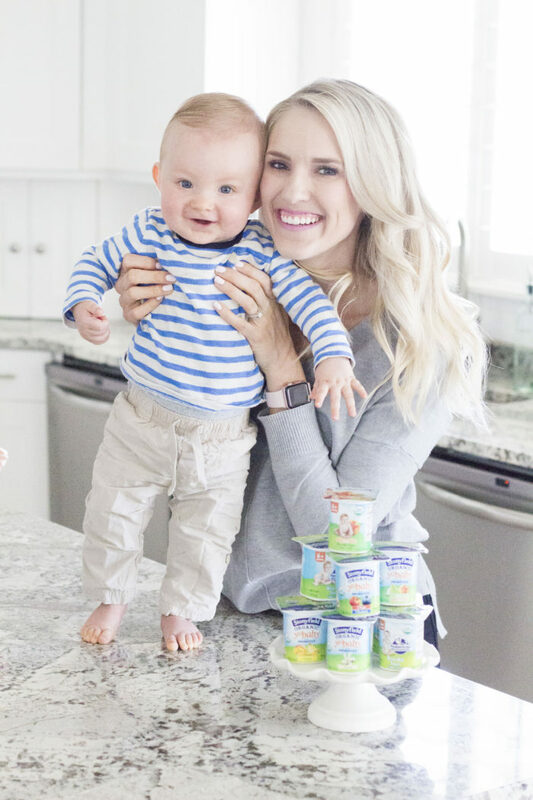 Stonyfield YoBaby® yogurt was selected as the number one pediatrician recommended refrigerated yogurt for babies 6 months to 2 years old which made me feel really good about giving it to him. It now features probiotics with the addition of the BB-12® strain. So what’s so important about the probiotic BB-12®? Gut health is the foundation for overall good health as babies grow and probiotics can help support a happy tummy. BB-12® has been shown to have a digestive health benefit when consumed regularly by promoting beneficial gut bacteria and regular, soft stools. In addition to live active cultures, S. thermophilus, L. bulgaricus, L. acidophilus, L. casei, and L. rhamnosus, YoBaby® yogurt now contains Bifidobacterium animalis subsp. lactis (BB-12®) which has been studied in babies and has been shown to have a digestive health benefit when consumed regularly as part of a balanced diet and healthy lifestyle. BB-12® is a registered trademark of Chr. Hansen. Safe dairy for babies under 12 months: Shopping for dairy can be confusing when your baby has stopped taking breast milk but is too young for cow’s milk. You might think it’s safer to avoid any new dairy products until they are at least 12 months, but dairy is packed with essential nutrients (such as calcium and vitamin D) for growing bodies, and it is an important part of a baby’s diet. The good news is babies as young as six months can begin eating yogurt, even if they’re breastfeeding. Not only is it a healthy option for their little bodies, but you’ll find that infants love yogurt! Choose a brand made with organic whole milk, like Stonyfield Organic YoBaby. 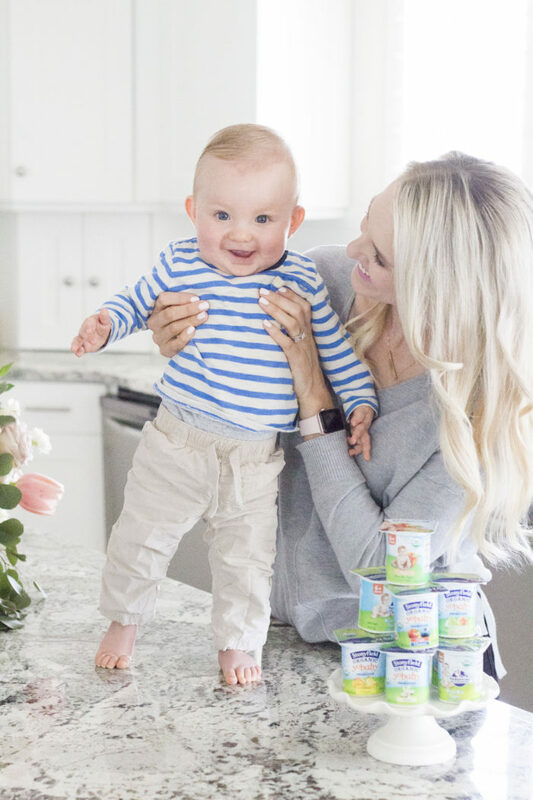 Trusted foundation foods that ensure your baby is receiving the proper nutrients: Eggs, prunes, avocados, fish, yogurt, cheese, nut butters, chicken, beans, lentils, berries, citrus fruits, green vegetables, whole grains, and water*. Mix and match these foods as your baby becomes more and more comfortable with solids. While naturally found in breast milk, probiotics are also found in yogurt, one of my foundation foods. Finger Food: Don’t be afraid to put down the spoon and let your little one try feeding themselves with some nutritious finger foods. My favorite way to start is with some cut up berries. The soft berries are easy for them to pick up and feel gentle against their gums. You’re helping to develop their fine motor skills and introducing a new and delicious snack. Note: As with all young babies, monitor their eating closely to avoid any choking. Probiotics: Babies are first exposed to probiotics in breast milk and it’s important to maintain digestive health as you introduce solid foods. Oftentimes, I hear from parents that they only turn to probiotics occasionally during the winter months or when baby seems irritable, but most probiotics are beneficial when consumed regularly. *As always, check with our pediatrician before feeding these foundation foods and modify as needed to accommodate any food allergies. Are you worried about giving baby sugar? Natural sugar vs. added sugar: Sugar is receiving a lot of attention in the news recently and many of my parent patients are looking more closely at labels when grocery shopping. Most importantly, we need to understand the difference between naturally occurring sugar and added sugar. 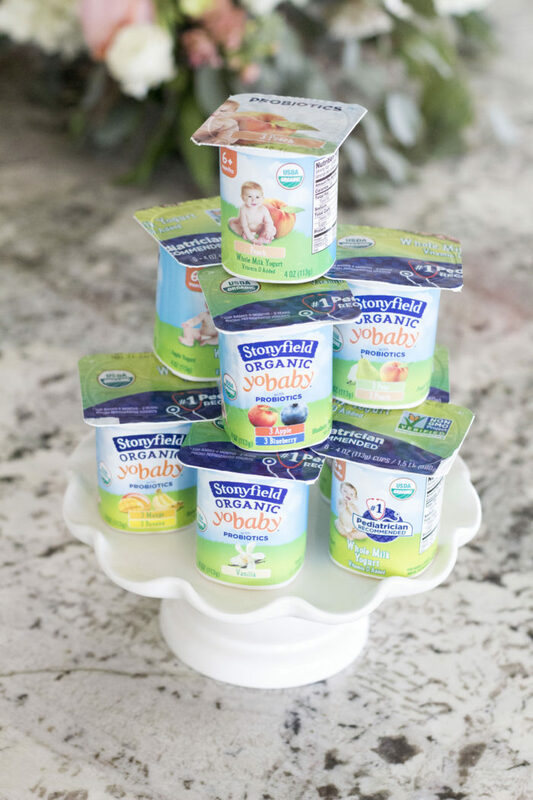 Stonyfield YoBaby® yogurt is the #1 Pediatrician Recommended brand of yogurt for babies between six months and two years old among refrigerated yogurts*¸with more than 17 years of experience making organic yogurt specially crafted just for babies. 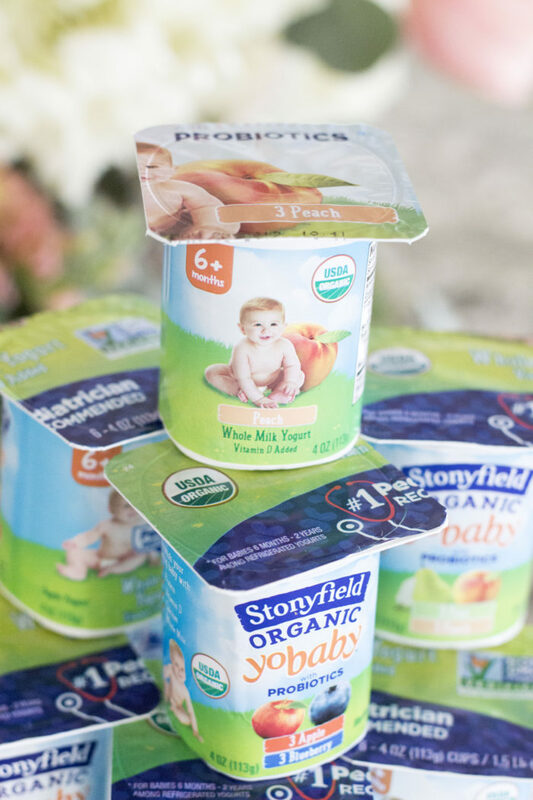 Not only is Stonyfield YoBaby yogurt the #1 Pediatrician Recommended yogurt for babies between six months and two years old among refrigerated yogurts, it’s the only organic yogurt made especially for babies. Stonyfield YoBaby is available in a number of flavors, including Plain, Vanilla, Banana/Mango, Blueberry/Apple and Peach/Pear, in 4 oz. 6-pack format. Stonyfield YoBaby® yogurt is also available in an unsweetened formulation – Stonyfield YoBaby® Plain. To learn more about Stonyfield YoBaby® yogurt as well as all other Stonyfield products and more, visit www.Stonyfield.com/yobaby. * Source: IMS Health ProVoice Survey, 12/01/15 – 09/30/16). This was great information for me to learn about feeding my babies! I feel like I have more direction when it comes to introducing new foods into their diets. I hope this was helpful for you as well, my friends! This post was sponsored by Stonyfield Organic, a brand I love. All opinions are my own. Previous Post: « The Top 6 Best Mother’s Day Gift Ideas! !